Thomas Tuchel will not put any pressure on Kylian Mbappe in terms of goals and assists targets for Paris Saint-Germain this season following the teenage forward's World Cup heroics for France. Mbappe scored a superb goal in Les Bleus' 4-2 final triumph over Croatia in Moscow last month, crowning a stellar tournament in which he was named FIFA's Best Young Player. Along with the rest of France's stars from Russia 2018 in the PSG squad, Mbappe is available to return to club action in Saturday's trip to Guingamp. Head coach Tuchel appreciates the next steps of the 19-year-old's career are highly anticipated and he sees his own role, in part, as one of managing expectations. "He is 19 years old and an incredible talent," he told a pre-match news conference. "I do not expect from him in terms of how many goals, how many assists – more development personally. "After his big success and the big role he played in the World Cup, now being here in the second year it is very important that we guide him on his way, keep him straightforward, calm him down when it's needed and push him when he's needed. "That's more what I want from him in terms of development instead of this amount of goals or this amount of assists." Tuchel led members of Germany's 2014 World Cup-winning generation at Borussia Dortmund and acknowledged players with more experience than Mbappe have sometimes struggled after conquering the game's summit. "It's very important to make it clear that after such a big success and no pre-season for such a young player… it's not just a question of age," he said. "I've seen many players who have struggled to say focused, hungry and calm after such a big success. "Sometimes, even if you keep your level after such a success it is a huge step forward. We have to keep the players and Kylian focused on working and doing the simple things. "Maybe, from then on, we will see. I cannot imagine, I have never had such a success, but we have seen in the past it is a challenge for the players to keep their level. "This is where we have to guide him and this [is the route to] development on a daily basis." Versatile defender Thilo Kehrer became another highly rated youngster in the PSG dressing room when he completed a reported €37million switch from Schalke on Thursday. "He can play maybe all four positions in the back four, he can maybe even play number six," Tuchel said when assessing his new recruit. "He is a player who is very flexible. He is young and hungry, has speed, intensity and a certain aggressiveness in his game. "This is exactly what we wanted to bring to the group and now we need to see how quickly he can adapt." Tuchel insisted further signings are possible at PSG before the transfer window closes, dismissing a suggestion that the club's obligations under Financial Fair Play rules were an undue hindrance. "This might sound a bit naive but I am not aware of our financial fair play problems," he added, "I think we can sign players and we will sign players." 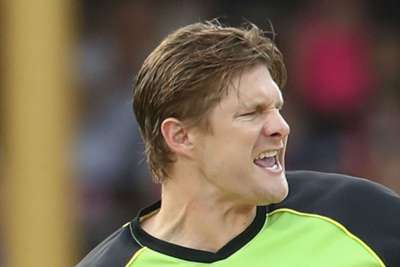 Shane Watson made a magnificent 96 as defending champions Chennai Super Kings beat Sunrisers Hyderabad.